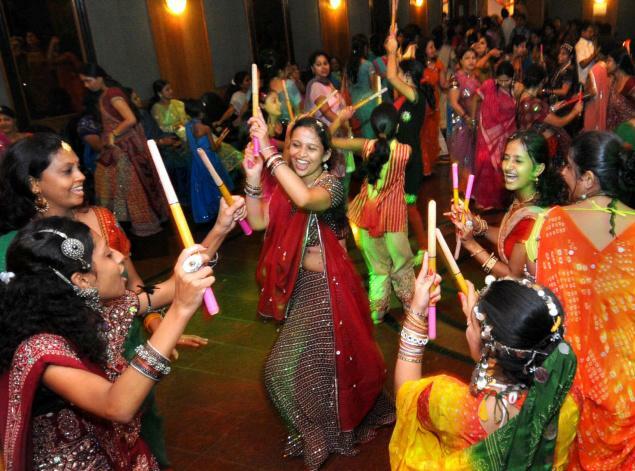 Dandiya is a popular folk dance form of Indian State of Gujarat. It was originated in Vrindavan and is performed to depict the scenes of the festival of “Holi” and “Raas Lila” between Radha and Krishna. 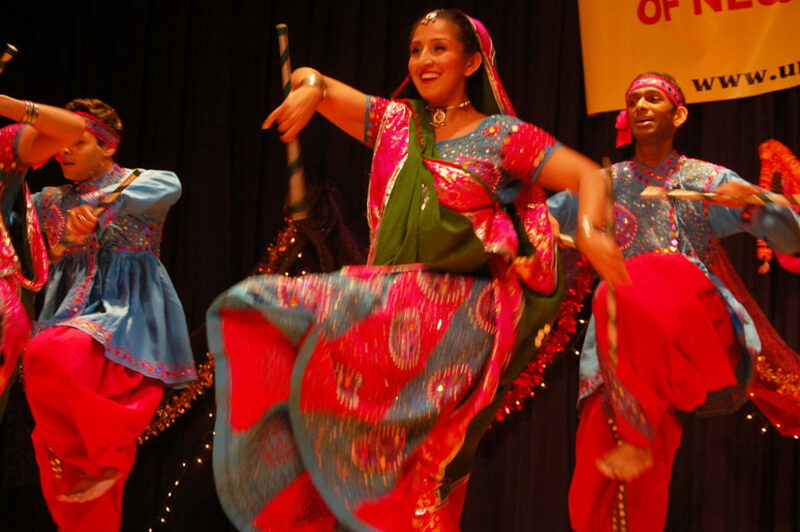 Dandiya is famous for not only the steps of dance but also for the colourful attires and the “Colourful Sticks”. Sticks are made of bamboo which is beautifully decorated and is striked alternately to the left and right on the tunes of the music that is being played. It is often confused with Garba. Garba is performed with hand and feet movement whereas Dandiya is played with sticks. Dandiya is an energetic folk dance which involves male and female dancers in large groups, providing an opportunity for acting and exchanging messages through eyes. It is also called stick dance. The dance is fast paced with the occasional presence of a drummer with “meddale” in the center of the circle, leading the dance in rhythm. While the days are devotion full, the nights are vibrant and festive. The state government organizes Dandiya nights for the entertainment of people. Traditionally Dandiya is performed after the Aarti of goddess Durga. It is the dramatized presentation of the fight between Durga and Demon King- Mahisasur. She rode on the lion and fought with Mahisasur (who was invincible and caused grave destruction and terror), for nine long days and night and on the tenth day she triumphed. 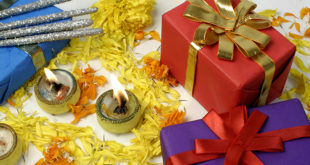 Those nine days are celebrated as Navratra and tenth day as vijayadashmi. 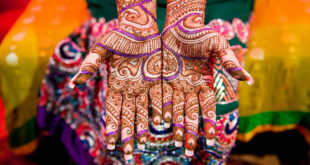 The first day is marked by Garba circles around the erected shrine of the goddess. The shrine includes a Garbo, an earthen pot in which beetle nut, coconut, and a silver coin are placed. 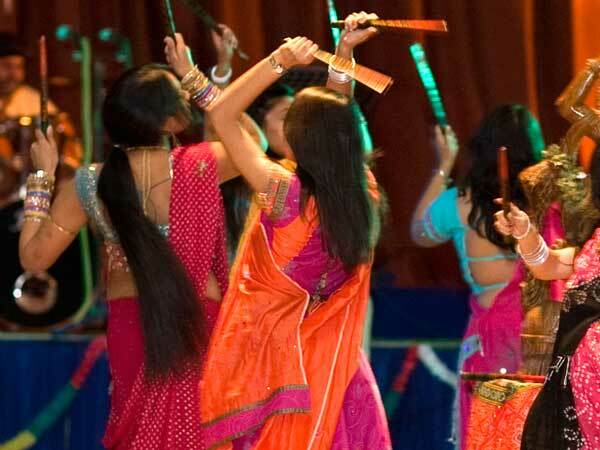 Dandiya is a folk dance of Gujarat where men and women dress in colorful costumes and dance to the beat of drum/dhol. This is performed during the Navratri festival in October. Young people form two circles and move around an imaginary circle in clockwise, anti-clockwise and diagonal directions with sticks in their hands called “Daandiyas”. Women wear “Chaniya Choli” – traditional three piece attire comprising of Lehenga Choli and dupatta. This dress is characterized by embroidery and mirror work done all over it. This is teamed together with big neck pieces, earrings, baju band (armlets), kamarband, maang tika, and jootis. The men, on the other hand, wear short kurti – “Kediyu” with kafni pajamas, with colourful turbans on their heads and mojri / Nagra in feet. Dandiya was originally performed by men with long sticks in their hands. The sticks represent the swords. This dance with the fast movement was for practicing footwork for sword fighting. Dandiya also celebrates the agricultural cycle of the region. 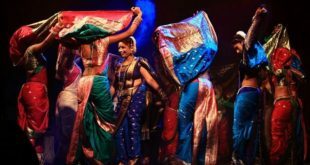 The modern day Daandiya is a fusion of Dandiya and Garba which is not only famous in India but all over the world right from USA, UK, Canada and Toronto. Today it is done at a professional level where the dance steps are choreographed in dance classes and youth love dancing on Bollywood numbers. Navratri in Gujarat is not just a Dandiya night but also worshipping of goddess Durga. People visit shrines and also worship at home.